If you’ve had a flood in your home or commercial building, the faster you contact professionals who perform water damage restoration in Philadelphia, the more likely it will be that you can minimize the damage and lessen the likelihood of creating a breeding ground for mold. Water damage restoration in Philadelphia is the process of restoring a property to its pre-damage state. The work can be tedious and exacting, and no two jobs are alike. Many times standards must be deviated from because of the unique nature of the water damage and the condition and setup of the structure in which it has occurred. Eco Tech employs highly skilled technicians who are experts in water damage restoration in Philadelphia, PA. Upon arrival at your site, they will immediately begin assessing the situation and then create a plan to initiate water damage restoration. In PA and other states that experience periodic high humidity, speed in performing this service is critical. Water that is allowed to stand can breed bacteria and other maladies. Wet furniture, particularly padded and upholstered furniture, will inevitably attract and grow mold, resulting in a problem that might actually be worse than the flooding. 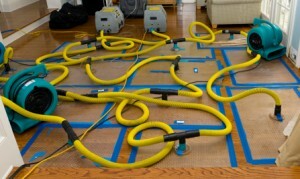 Water damage restoration in PA addresses both sides of the problem. Whether it’s a private home, an apartment building, a commercial office complex, a warehouse or any other structure with a water supply, you need to have a flood disaster plan. What kind of plan? Our phone number, written down in a place where you can access it quickly. Water damage restoration in PA is a complex business, and chances are you won’t be able to solve the problem by yourself. Eco Tech standards are set high in order to provide you with the most thorough and careful water damage restoration in Philadelphia, PA. In many cases, flooding that can create an urgent need for water restoration in PA can be avoided. Order regular inspections of water systems within your property/facility. Check for small leaks that could become big ones. Replace old or rotted pipes. Don’t let anybody dig unless they have a map of underground pipes. Make sure key people know how to shut off the water main that brings water to your building. But even still, flooding does occasionally happen. At these times, it’s good to know you can get the help you need with just a phone call. Water restoration in PA is a service we take very seriously, and we’re quick to respond to these calls. So remember: keep our number handy, call ahead and learn about the process and have your water system inspected on a regular basis. This is what you can do. We’ll do the rest. For information on water damage restoration in Pennsylvania, contact us at 833-277-3100 to learn more.